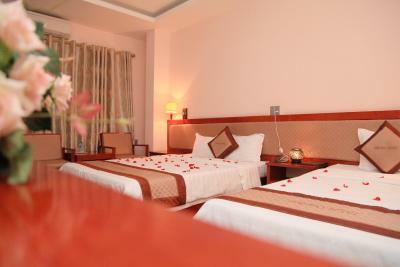 Lock in a great price for Paradis Hotel – rated 9.3 by recent guests! 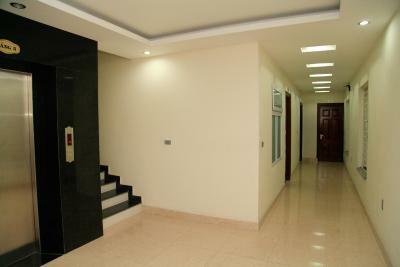 Decent location right by the Vinmec international hospital. Spent the holiday at paradis. It was great! It was so nice of them to give free food and drinks to celebrate the event. Staff were very lovely and the overall vibe of the hotel is nice. It's definitely a cool hotel so it's the best place to meet people and have fun. Had an amazing time at paradis! 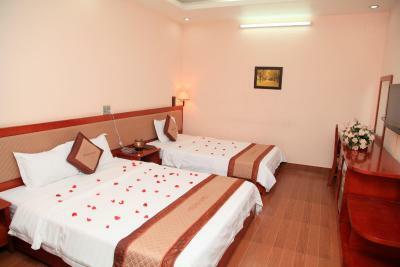 Great Hotel Affordable price and good location. A clean room and a fine breakfast. Employees who are better and more kind than these. 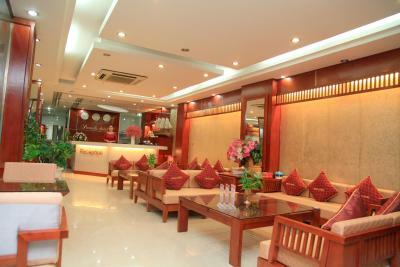 There was never a time when I was not satisfied with the service during my stay. Next time, I will visit this hotel. Thank you so much. Book one nighr but stay five night, near local maker,shoping centre, friendly staff,room big and clean, good location, recomment for all. will come back. Realy goog, close to everything,shoping,treet food bank, central park near beach friendly staff ,bikecikle free is nice. Thank you for all. Very close to food and things to do. Friendly staff and comfy beds. Alex is a very helpful meme we of staff and made sure my trip was enjoyable. He also provided me with helpful travel advice.Thanks and hope come back 1day. 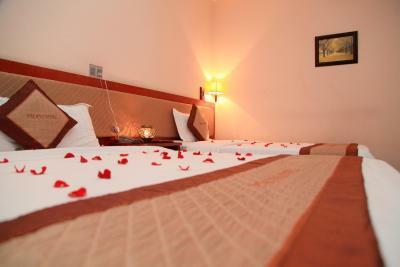 Paradis Hotel This rating is a reflection of how the property compares to the industry standard when it comes to price, facilities and services available. It's based on a self-evaluation by the property. Use this rating to help choose your stay! One of our best sellers in Ha Long! 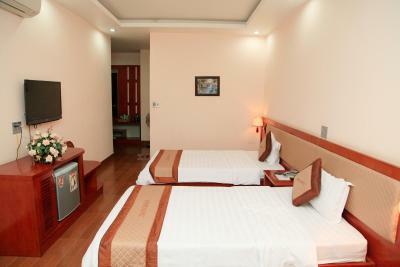 Paradis Hotel provides air-conditioned rooms with free Wi-Fi in Halong. Guests have access to free private parking, a 24-hour front desk. 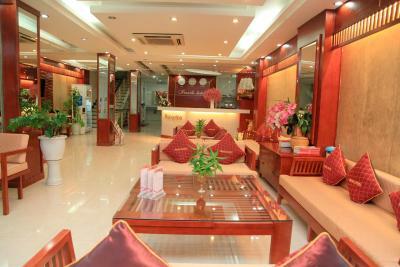 The hotel is 1,650 feet from Ha Long Market. 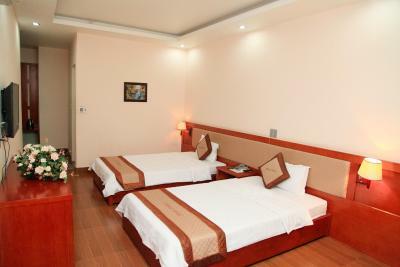 Ha Long Bay is 6.2 mi from Paradis Hotel. Cat Bi International Airport is 24 mi away. Hanoi is 99 mi from the hotel. 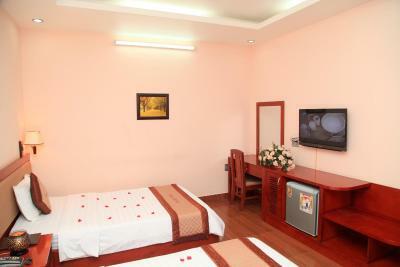 All rooms have a flat-screen cable TV, mini-bar seating area and desk. Private bathroom comes with a shower, hairdryer and free toiletries. Guests can rent motorbikes during their stay. 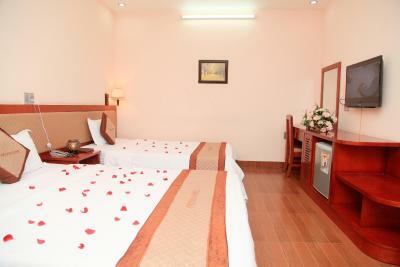 Shuttle, laundry and ironing services can be arranged at a surcharge. This property is also rated for the best value in Ha Long! Guests are getting more for their money when compared to other properties in this city. 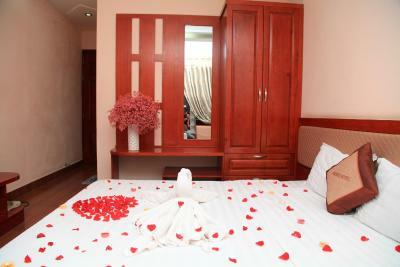 When would you like to stay at Paradis Hotel? Featuring a double bed and window offering city views, air-conditioned room includes a flat-screen cable TV, mini-bar seating area and desk. Private bathroom comes with a shower, hairdryer and free toiletries. 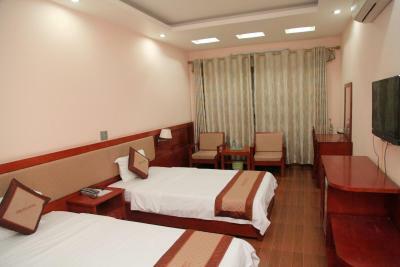 Featuring 2 single beds and a window offering city views, air-conditioned room includes a flat-screen cable TV, mini-bar seating area and desk. 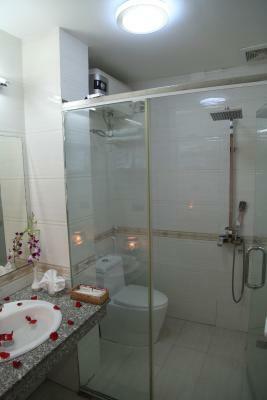 Private bathroom comes with a shower, hairdryer and free toiletries. 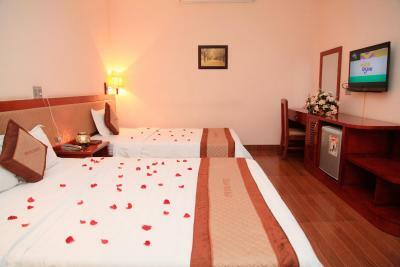 Featuring single and double beds, spacious air-conditioned room includes a flat-screen cable TV, mini-bar seating area and desk. Private bathroom comes with a bathtub, shower, hairdryer and free toiletries. House Rules Paradis Hotel takes special requests – add in the next step! 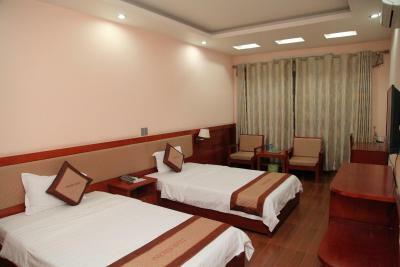 One child from 7 to 10 years is charged VND 58397.66 per person per night when using existing beds. Paradis Hotel accepts these cards and reserves the right to temporarily hold an amount prior to arrival. We enjoyed staying here. 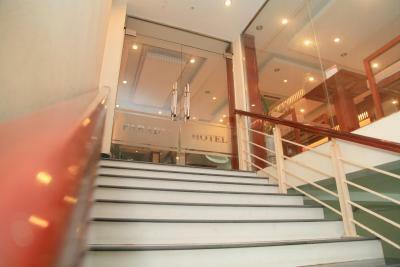 There is an elevator which helped as there are 7 floors. 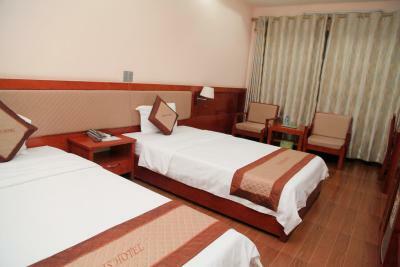 Hot water, good wifi, comfortable beds good A/C. The breakfast was very good, serving eggs to order. Most amazing are the staff, each and every one of them was so kind, courteous, and helpful, always smiling! In particular, I remember Dave, thank you Hieu Vu. The hotel rooms were spotless clean, the showers & AC are wonderful, the beds are super comfortable and our sleeps were terrific. Breakfasts (eggs/pancakes/noodles/sandwich) were great with lots of variety including hot/cold options and tasty fresh fruit too. Excellent hotel for the price. No room service but plenty of places to eat nearby. Service is 5 star. We stayed 2 nights and all the staff were extremely helpful and friendly. 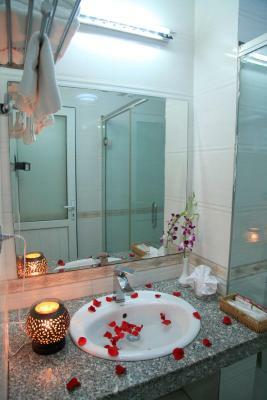 We had booked one night at a high end luxury hotel for our last night in Halong to celebrate our anniversary. When we mentioned this to the staff upon checkout they arranged to have our bags sent to the next hotel and arranged the porters to take us there on their scooters so we could experience Halong like the locals. Great Hotel in Halong Stayed here with my husband and our friends for 2 nights. 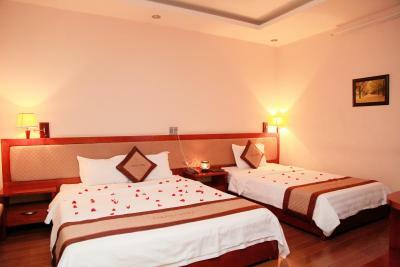 Great location, fantastic friendly staff, clean, comfortable and spacious rooms. Breakfast options is enough to start your day, not a massive choice but nicely cooked. I would definitely stay again due to how friendly and helpful the staff were. Hieu Vu went above and beyond to help make our stay special! AA Stayed here as a group of 3 and it was fantastic! The room was immaculate, the bathroom was a dream and the lovely Hieu Vu (and Ken) at the front desk went out of their way to make sure we had everything we needed. We hope to be back again!